Is Philadelphia Expanding its Casino Industry? Ah, the City of Brotherly Love. The only place on Earth where it’s always sunny and no one, not even Santa Claus, is too good to be booed and pelted with snowballs. To this point, Philadelphia gamblers have had a single choice when it comes to casino gaming, but that appears set to change in the coming months. On Tuesday, the city’s planning commission approved the master plan for its second casino following a collection of zoning changes. The revised master plan for the $500 million project followed an August letter highlighting four topics that needed to be adjusted. Among these issues, an updated signage plan, a public art requirement, adjusted lighting levels in conformance with codes and landscaping regulations took center stage. Live! Hotel & Casino made the necessary adjustments over the past few weeks, including eliminating two large-scale digital billboards, and has now received the required majority vote to proceed with casino development activities. The approval is contingent on further approval from the city council to tweak the proposed location’s zoning restrictions in order to allow the development in its current form. Issues regarding the project’s size and use of outdoor signs will also be reviewed by the city council. Despite the approval, members of the Philadelphia Planning Commission suggest that the proposed casino design still has a few issues that will need to be addressed. In particular, the project reportedly lacks necessary open areas and has too much floor space to comply with the local building code. The option to relax the requirements of the ‘special purpose entertainment’, or SP-ENT, zoning classification will be weighed in the council’s proceedings. The developer of the new casino has already begun seeking these approvals, despite a legal challenge by rival groups to the gaming license the new casino was granted last November. According to the suit, Stadium Casino, the developer, maintains an interest in the Parx Casino in nearby Bensalem, which should have disqualified it from obtaining a second license. These claims are currently being investigated by the city council, and a decision on this appeal is expected to come as early as this fall. Pending further approval, the Live! 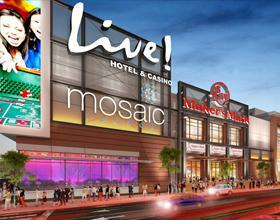 Hotel & Casino is expected to be the second gambling venue to open in Philadelphia. The first, the SugarHouse Casino, originally opened on the Delaware riverfront in 2010. Following final approvals and permitting, development of the Live! is expected to take approximately 15 months to complete. Current plans call for a 19-story hotel attached to a seven-story parking structure, with gaming, dining and entertainment available on the complex’s ground floor. Additionally, the parking structure is expected to feature a landscaped ‘green’ roof. As Philadelphia rapidly approaches the next chapter in its casino story, the spread of gambling options throughout the country continues to pick up steam. Earlier this year, Massachusetts made history by opening its very first casino, and other states, including Georgia, are putting the wheels in motion for possible future entry into the casino industry. For players across the nation, this expansion means that taking a dance with Lady Luck is easier and more convenient than ever before!